Once the integrity check on the RAID 1 Array was complete we ran a couple benchmarks to see how the F2-420 performed with basic sequential Read and Write tests. Using CrystalDiskMark 5.2.2 x64 we were able to hit 117.1 MB/s Read and 118.4 MB/s Write, which is about as good as you are going to get on a Gigabit LAN (1000 MBit/s). If you crunch the numbers you’ll find out that 118.4 MB/s is equal to 947.2 Mbit/s, so by the time you factor in overhead of a Gigabit Ethernet based network this is about as good as it gets. Most consider 118 MB/s to be the number to hit for actual data on Gigabit Ethernet without tweaking the Maximum Transmission Unit (MTU) for Jumbo Frames. TerraMaster rated this model as having speeds of up to 110 MB/s read and 105 MB/s write, so we are well over their rated speeds. 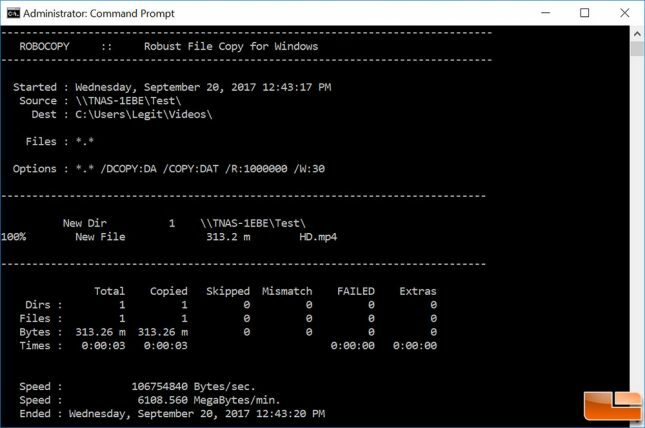 We also used ROBOCOPY to move around some MP4 movie clips we had and found that we were getting 106754840 Bytes/sec or 106.8 MB/s when pulling items from the Terramaster F2-420 NAS. Upload speeds were around the same, so we were happy with the 105-110 MB/s speeds that we were seeing. These numbers are of course with one user pulling data down. TerraMaster says the F2-420 supports more than 1000 users as well as SMB, AFP, NFS, ISCSI, FTP and other file transfer services. TerraMaster says that the F2-420 is energy efficient, so we wanted to interdependently verify that. With green energy-saving design, the power consumption of F2-420 is only 17W in the operation status and just 2W in standby. Once the device has no operation task in 10 minutes, the hard drive will automatically sleep, which reduces the power dissipation and extentd the usage life of the hard drive. 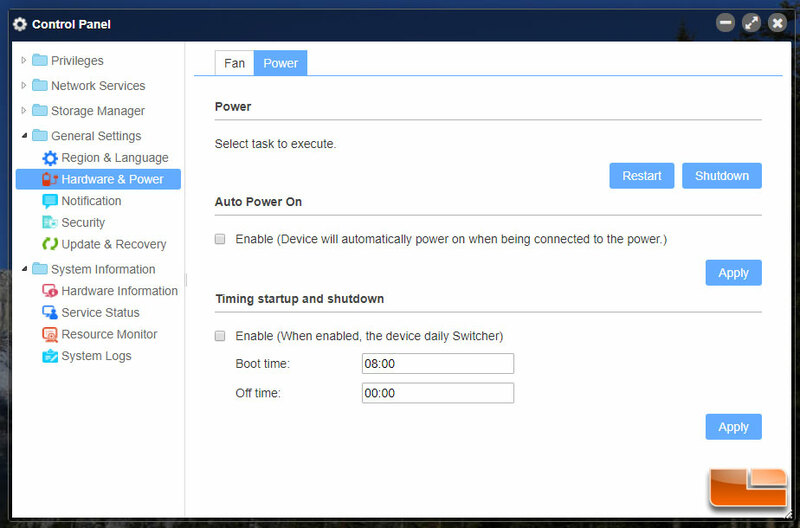 According to that statement we should be seeing just 2 Watts of power draw with the NAS in standby mode after 10 minutes of inactivity and around 17 Watts in operation. Our TerraMaster F2-420 wouldn’t go into a standby mode for some reason, but at idle we were using just 5.4 Watts and during active file transfers with one user and one LAN connection we were using 10.4 Watts. Our system had two Samsung SSD 850 EVO 1TB SSDs setup in RAID 1, so this might be due to our drive choice. We looked at the power settings menu under Hardware & Power and didn’t see any other options we could enable for standby mode. The specifications page states that you need to enable hard drive standby function (HDD Hibernation) next to the 2W figure, so it looks like you need to do that. 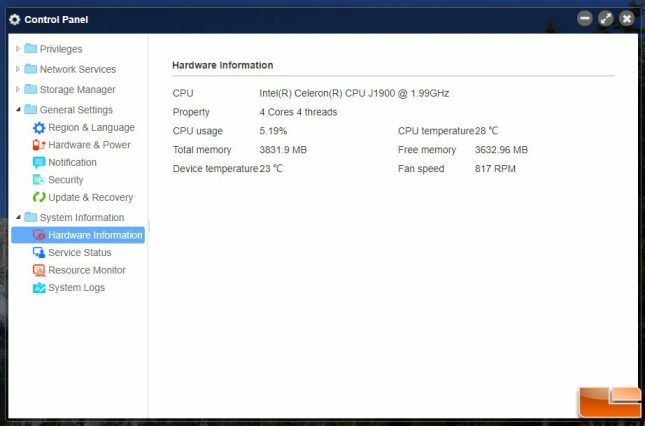 TerraMaster suggests using Western Digital (WD) Red NAS Hard Drives on this model and used WD 1TB drives for their power consumption testing numbers. 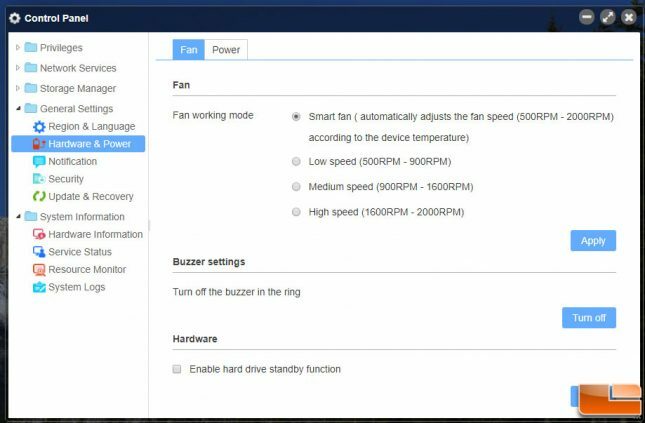 You can’t turn the fan of the TerraMaster F2-420 off, but there are four fan profiles that you can select from: smart fan, low speed, medium speed or high speed. We left the F2-420 stay at the default setting of Smart Fan and observed the fan to be running right around 820 RPM with the CPU sitting at 28C and the device temperature reading at 22-23C at idle. You can hear hear the fan if you are within a few feet of the NAS in a quite room, but the fan noise isn’t bad around 820RPM. Our sound meter was showing less than 1dBA over ambient room noise levels, so nothing of concern there. The CPU usage was always around 3-4% at idle and we’d see it hit around 33% for single file downloads and 48% for single file uploads. If you have multiple users in a home or small business we certainly suggest going with the quad-core F2-420 model over the dual-core F2-220 model if you want the best performance possible. A dual-core NAS would be close to if not at 100% load with just one large file upload, so there is a good argument for 4-cores in a NAS these days. The TerraMaster F2-420 was a little tricky to get up and running, but once we got it working we found it to be a fast device with over 115 MB/s read and write performance. We could easily stream 4K Ultra HD videos and had fast data transfer speeds between our devices. We’d say that the F2-420 will easily max out your Gigabit network and allow to to quickly access and share your videos, photos and files. The TOS 3.0 operating system was found to be responsive and wasn’t sluggish or found to be something we hated. We wish it had more applications to install, but TerraMaster is working on that. TerraMaster isn’t as big of a household name as QNAP, Synology, Drobo, WD or Seagate, so getting app support is going to slower. The build quality of the NAS housing is okay. It doesn’t have a heavy quality feel to it and isn’t all aluminum, but a NAS shouldn’t see too much abuse. 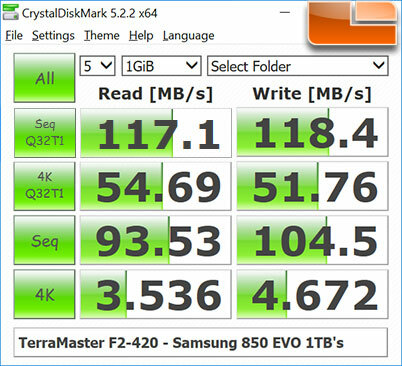 At the end of the day the TerraMaster F2-420 should work great as a basic file server for someone that wants to hit Gigabit speeds on file transfers. If you are a long time NAS user looking for advanced features then you might want to look at some of the more well known brands to get a better experience on the software side. You can purchase the TerraMaster F2-420 for $299.99 shipped on Amazon and it comes backed by a 2-year warranty. We used two Samsung SSD 850 EVO 1TB 2.5-inch SATA SSDs for this article and those run around $339 each, so this build was $977 if you wanted to copy it. Most folks will be running 3.5″ NAS Hard drives on these and that is good as TerraMaster recommends Western Digital (WD) Red or Seagate IronWolf NAS hard drives on these models as they are designed for 24/7 always on accessibility. WD Red 1TB NAS drives run $62.99 each, so you can get a 1TB RAID 1 setup with the F2-420 for around $426 total! It should be noted that the TerraMaster F2-420 supports up to 10TB hard drives, so you could potentially turn this into a 20 TB storage device if you were to run it in RAID 0! If you wanted to check out the TerraMaster product page for the F2-420 you can find it here. 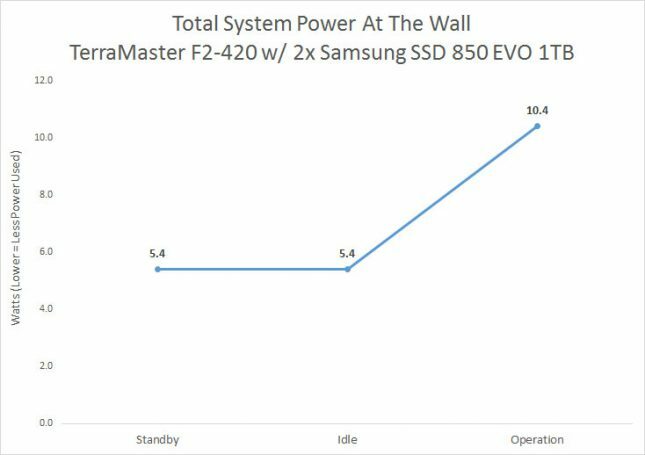 Legit Bottom Line: The TerraMaster F2-420 was found to be fast, power efficient and a decent mid-level 2-bay NAS!